I am no stranger to buying embarrassing things. Back in the 90s, I became quite used to being the only non-Asian guy in the local Japanese bookstore and the only guy, period, in the shojo manga section. I’ve been the guy who got to the Software, Etc early on release day to pick up his copy of “Dead Or Alive: Extreme Beach Volleyball” and I will defend the cinematic glory of “Super Mario Brothers: The Movie” to anyone who will stand still to listen before they suddenly remember that they have somewhere to be. I have no taste, no class, and (most importantly) NO SHAME. It was therefore an unfamiliar and uncomfortable sensation to find myself walking past the “My Little Pony” aisle in my local toy store trying not to look like I was looking down the aisle. Here’s what brought me to that sad state: I spent the week after Christmas sick as a dog. With little energy or ambition in me, I spent most of that time on the couch in front of the TV. At one point, I decided that I would see what all the hype was about “My Little Pony: Friendship Is Magic”. After three episodes, I wasn’t really seeing the reason for all the online enthusiasm surrounding the show, but I was also too addled to think of anything else to watch. After a few more episodes, I couldn’t stop watching. After 37 episodes, I found myself haunting the toy aisle looking for pony merch to make my own. I am buying this for my niece, I decided, that’s what I would tell the cashier. She has a birthday in January, I would say if asked, an excellent reason to explain why a grown man might be shopping for his alleged niece after Christmas. The cashier did not ask questions, so my elaborate fiction was unnecessary. She simply rang up the cotton-candy-pink box without question or comment. Perhaps she’d seen it all before, perhaps she simply didn’t want answers to the questions gnawing on her mind. 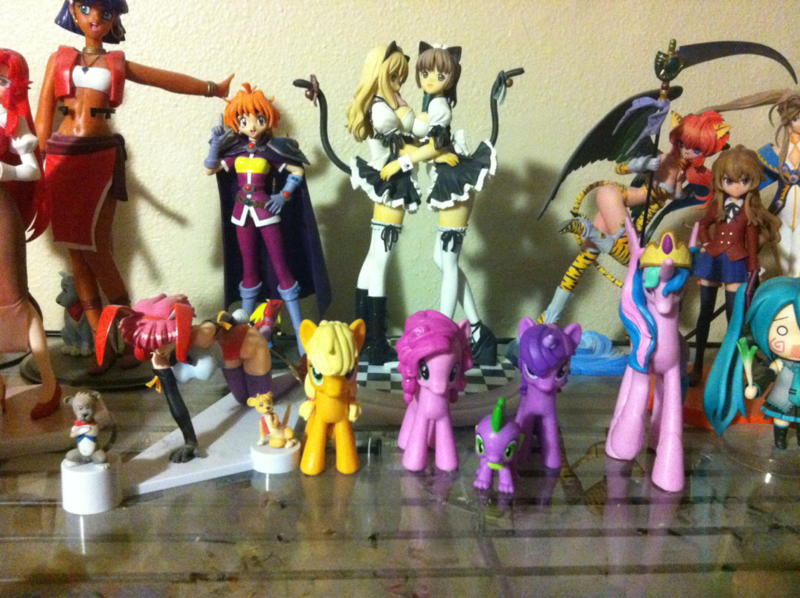 Once my new treasures were home, freed from their suffocating plastic shells to join a shelf of figurines dominated largely by catgirls and maids and catgirl maids and other figurines of dubious standing, I had time to reflect on what I had done and why a show about, well, magical ponies had kept me so glued to the television. My first answer was, well, it’s a fantastically funny show. It has a good mix of slapstick and subtle humor – if you want to see a unicorn getting hit with an anvil, it’s got that (yes, really an anvil, always good to see an old Looney Tunes classic brought back for a modern cartoon), but it also rewards careful attention to dialogue and has enough background detail to reward judicious use of the pause and slow advance buttons. It also has a lot of horse related puns, so your enjoyment may be directly tied to how many of those you can tolerate. Some of them are subtle enough that they will fly right past someone not raised in a pun-friendly household, anyway. That was a start, but not really a complete explanation. My next explanation was that it was, simply put, a change of pace. I’m a bit of a cynic on my best days and I can get downright gloomy given half a chance, so by all rights I should be writing off a show like this as a unabashed cash grab, designed to separate the parents of little girls from their hard-earned dollars. And, well, it kind of is a cash grab, but it’s also an unrelentingly optimistic and positive show with a good message, something it somehow pulls off without crossing the line into preaching. There are a couple of early episodes where the obligatory moral of the show is hammered in with a lack of subtlety – and generally with a new character whose only purpose is to be a bad example – but those stand out because they are exceptions. Tl;dr version: even if – especially if – you’re fundamentally bitter and cynical, sometimes it’s nice to watch something upbeat. 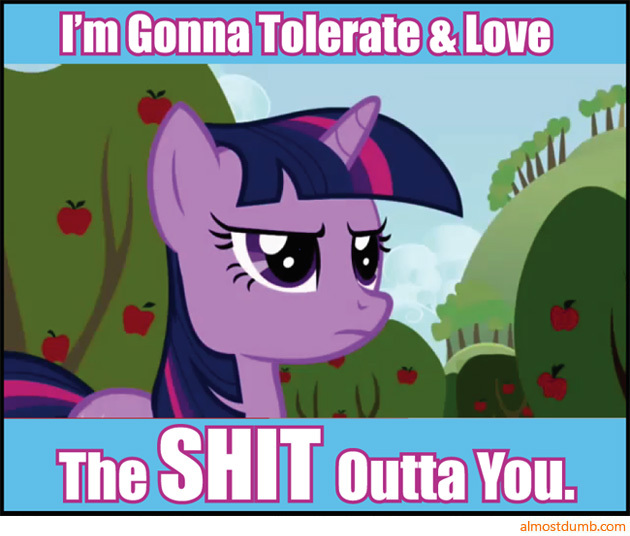 And then we have the online fandom, the “bronies” as it were, who stand out in online fandoms as being, well, nice. Downright civil, even, though I confess that I haven’t delved deep into the murky depths of the community and I’m sure that it has a few jerks scattered around. Much of this general civility can be tied, I think, to the absurdity of it all. It’s hard to take things too seriously when you’re expressing your admiration for the exploits of a character named Fluttershy after all. 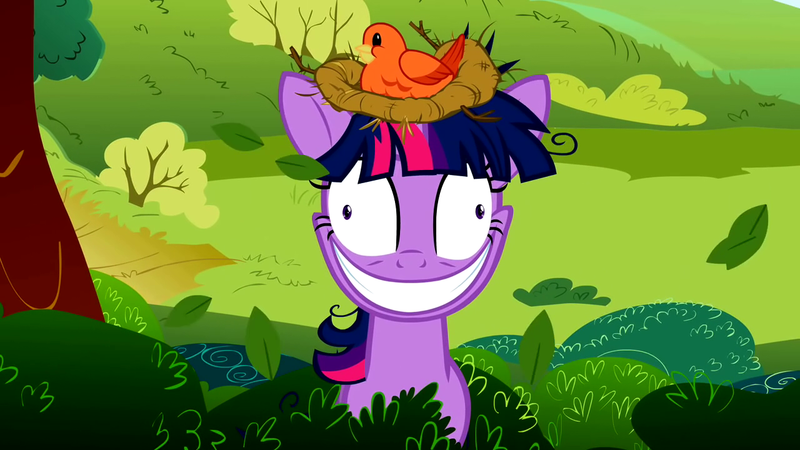 Just so we’re clear, though: Twilight Sparkle IS Best Pony. This entry was posted in mlp:fim, movies & tv. Bookmark the permalink. Nuh uh, Fluttershy is best pony, followed closely by Rarity – Twilight Sparkle is a distant third, Applejack & Rainbow Dash are trailing far behind and tied for fourth… and Pinkie Pie is still in the stable. You have been seduced by the Pony side of the force…. Welcome. This is an old post I know, but it came up in the related posts to the one I just commented on, so… yeah! I love me some MLP, and I figured out pretty early on is that it’s because it has a lot of crossover in terms of core appeal elements with anime and video games. It’s colourful, it’s loud and exuberant, it features exaggerated emotional reactions and over-the-top storylines (particularly in the season finales, which often go Full JRPG at a moment’s notice), and it has a strong focus on awesome characters that you are implicitly encouraged to argue about which one is the “best”. I like it when folks dig back in the archives! 🙂 It makes me re-read things so I can think about them again. The whole show just has an aura around it of “it’s OK to be happy”, and I think that’s one of the things that still draws me to the characters. I’m a couple of seasons behind, actually, I think the last episode I saw was the zombie ponies episode in Season 6, and now Season 7 is almost over. Obviously I need to catch up!